JCBL - is a name synonymous with high quality, utmost safety, groundbreaking technology and futuristic styling in Indian Automobile Industry. From being incorporated in 1989 as a company that would manufacture high quality Japanese technology buses and load carriers for Indian automobile industry like Swaraj Mazda, Eicher and TATA Motors, JCBL has today evolved into a highly successful bus coach manufacturing company. JCBL is a conglomerate of several national and international companies and is the largest bus body builder in the India providing world class mobility solutions in adherence to stringent quality standards like ISO 9001 & TS 16949 by TUV. 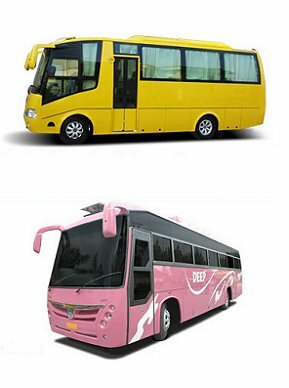 Founded in 1989, JCBL is renowned for producing high quality luxury bus, coach vehicles, mobile home, special application vehicles, school buses, and ambulances. Since its inception, the company has been working relentlessly to offer its patrons the best in technology and comfort through its premier buses and coaches. The company's highly skilled bus manufacturers and design each bus coach using only top quality and finest materials, components and technology available.